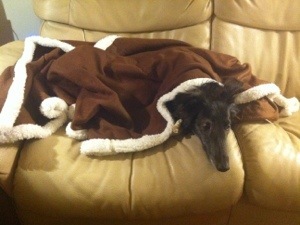 Lenny, Keith’s American Silken Windhound (about 18 mo old), snuggles with his new blanket and a Christmas treat. In spite of it all, my little family had a good holiday. Yes, I cried on Christmas Eve, not so much out of impenetrable sadness. But the kind of tears that well up inside when I speak of Keith and suddenly and intensely miss him. Is it bad that I can go long periods without crying? Is it wrong that I only cry when I speak of him a certain way? Or when I am driving down the road and suddenly am overcome? Regardless, this is how it comes about at moments that are unpredictable but when especially when I allow myself to sink a bit into that place of simple and unfettered sadness. But then I get past it and feel better again. So when I awoke this morning, the sun was shining on some fresh snow and daughters and son-in-law were going to continue in our family tradition of volunteering at Flint’s north end soup kitchen. We’ve been coming for 10 years to take photos of kids with Santa Claus. And our tradition has followed the evolution of photography as we originally started with an old Polaroid camera and now have a full-fledged photo set-up with professional lights and digital photography. My older daughter has taken over the actual picture-taking while younger daughter and son-in-law man the printing stations to make sure the kiddies all get their special holiday pictures. I usually take “color” background photos but this year, due to an unanticipated shortage of volunteers, I manned the line to face the kids as they waited to take their turn. It felt good continuing this family tradition. I admit that yesterday I almost chickened out and thought about just staying home while my kids did the work. But I was glad I went, catching up with staff, and some old and new volunteers. And, although I had to give some sad news to one of my regular volunteer friends there about Keith, I managed to do it without getting overly emotional. I don’t mind the curiosity that some have about the details of the diagnosis and treatments, or the process of dying and grief. If I didn’t feel up to talking about it, I would simply find a way to change the subject. But in most cases, if my friend still is asking, and the questions are within my ability to answer, I do so. I do it because maybe others will benefit from the lessons of our experience and Keith’s life. Once back home, the rest of our day has been a happy one, filled with good food, lots of special gifts, from silly to useful, but all appreciated, more good food, and family togetherness. 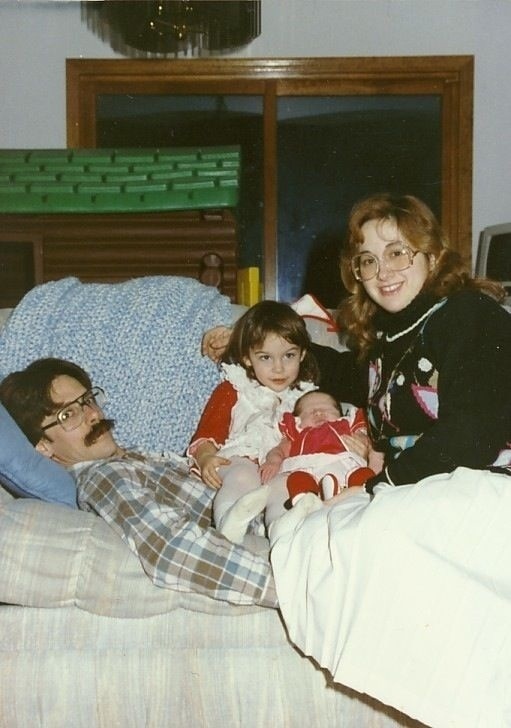 We didn’t hesitate to share stories of Keith, or invoke his humor as we broke out in spontaneous laughter. At one point, younger daughter Stassia gave the older daughter Sarah a copy of Emerson Lake & Palmer’s Tarkus album LP. It was the kids favorite one of Keith’s albums, mostly because of the album art of an armadillo with tank tracks on the cover. But that led to playing the cd on the iPod on our stereo. And then that led to stories of Keith using his ELP, Jethro Tull, and Yes music to soothe the kids to sleep when they were babies. Anyone who knows the music of these groups knows that it can be hit or miss on “calming”, and the music could easily devolve into an electronic psychedelic musical hallucinatory experience. But it’s all what you’re used to. When I was pregnant with our first who, as I mentioned in my last post was “late”, we attended an ELP concert at about 9 days after her due date. Sitting next to the speakers, Keith and I tried to shield my large liquid-filled belly from the heavy vibrations of the nearby giant speakers. But eventually we moved to different seats as I couldn’t handle my belly’s continuous vibration any longer. So when our daughter was finally born five days later, the nurses had a good laugh trying to spit down her spikey hair which kept sticking up like a little Mohawk down the middle of her tiny head. But sure enough, whenever she became fussy, Keith could put on an ELP album and she would calm right down again. So the impact of music was instilled from the womb and has continued to entertain and comfort us to this very day when we put on the same music to honor Keith. In spite of his physical absence, we could feel him there in spirit. Now, as I write this, the tv is playing one of Keith’s favorite home improvement shows “Holmes on Homes” where the protagonist contractor Mike Holmes is the hero of the day. Keith thought of himself as the contractor/woodworker hero, one who could make anything work, who could solve the problem and do it with special attention to quality. Lenny, the Silken Windhound, lays sprawled legs up in a goofy sleep. And I miss Keith. But I have survived this holiday and will survive the next. And I’ll be stronger for it besides. I’m not alone. My daughters and son-in-law are on this ride with me, as well as other family and close friends who are on the journey of grief, too, missing Keith terribly. I feel and know their pain very well. … I think about my own year and reflect. No matter how painful it has been for me and the family to see Keith go through his illness, to say goodbye to my best friend and husband, for them to say goodbye to their father and guide, we feel blessed. It was a blessing I embrace for the many years that we shared as husband and wife, the life that we had, the children we raised, and the legacy of true deep friendship, laughter, love, and curiosity that he created and shared with everyone he knew. It is the epitome of the lessons he shared with me and others near the end. Live your life without regrets, love without hesitation, and embrace your passions, honor your family, friends, and loved ones. With this true gift, life has meaning beyond the number of years that can be counted. So with those thoughts, I will again wish you all a very special, warm and loving holiday season and warm wishes for a prosperous and loving new year. Live it well. The kids always liked this album of Keith’s, somewhat for the music, but mostly for the album art.